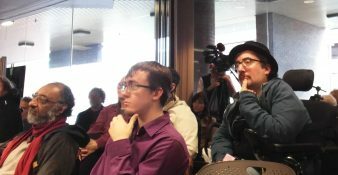 The spacious community room at Victoria’s Central Library was packed, even spilling into the hallways and with people peering through the outside windows. 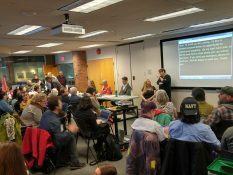 On April 27, the Victoria Disability Resource Centre hosted a political candidate’s meeting on disability and accessibility, as part of the BC election campaign. 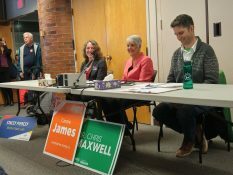 Several popular icons attended the event: experienced political radio personality Kim Emerson (CFAX), Green Party candidate Dr. Chris Maxwell, Liberal Party candidate Stacey Piercey, and the incumbent MLA, NDP candidate MLA Carole James. Along with the candidates, the VDRC also partnered up with 9 disability-related organizations in Victoria for the event: Victoria Brain Injury Society, Power To Be, InclusionWorks Saanich, Lifetime Networks, Pacific Training Centre for the Blind, Together Against Poverty Society, Action Committee for People with Disabilities, Move Adaptive Fitness and Rehabilitation Society of BC, and Phoenix Human Services. Each organization contributed key questions that were submitted for the panel. The questions all had a recurrent theme in common: the need for increased funding and a streamlining of services. While attention to the issues affecting people with disabilities has increased over the recent years, it’s not enough. Living in an environment with an aging population, rising costs of living, an affordable housing crisis and competitive workforces, disabled people can feel like they and their needs are not being prioritized at this moment. The VDRC also got praise for making sure that the event was accessible for everyone. A captionist and interpreter were there front and centre, and the event was live-streamed on Facebook for anyone who missed or were unable to attend the event. And later, a professional video and a full transcript of the meeting were uploaded for the public. 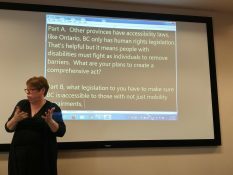 Receiving so much praise for accessibility also led to a sad realization: people with disabilities are constantly put at a disadvantage everyday: often by not providing adequate access, they are often excluded from a thing that is their fundamental right as Canadians: participation in our democratic process. Several Canadian studies suggest that people with disabilities have lower rates of voter turnout compared to people without disabilities. The VDRC hopes that the event will serve as a template for accessibility in future candidate forums in BC and that people realize that people with disabilities deserve a louder voice in government and a direct line to exercise the voice.